Fall is the season where I want everything to be COZY. My plush duvet slippers feel so cozy. My yoga pants feel so cozy. My fireplace is so cozy. EVERYTHING IS JUST.SO.COZY. Except my family room. That was not feeling at all cozy after the “dog barf episode” involving our white slipcovered sofa. In disgust after the incident, I threw away two of the three seat cushions so the shell of the sofa has just been sitting there in the family room naked and unusable. Without its seat cushions, it wasn’t cozy or comfy at all. My whole family room felt disheveled and torn apart. Sadness. That’s not how I picture life at home in the fall. I cleaned the sofa really well so it didn’t smell anymore so YAY for that, but still. It didn’t have cushions. Not ideal. Once I realized my new sofa wasn’t going to get here until after the holidays, I decided I just couldn’t take an entire winter of an UNCOZY disheveled family room. So either I was going to have NO sofa (which was an option, but still, NOT COZY) or I was going to get creative with the cushions and make the old Pottery Barn sofa work for another four or five months. Years ago when the back cushions began to lose their fluffiness and started looking really flat and saggy I supplemented each of the cushions with a bed pillow inside of the zippered slipcovers. While it wasn’t a perfect solution, it was a “good enough for now” idea. The cushions felt much more firm and comfortable. So armed with my “I can make this work” attitude and a determination to put my family room back to a cozy state for fall and winter, I sent my husband to the storage space under the house for the gray slipcover I bought a few years ago at IKEA, and then I dug around in the garage and found two back cushions from outdoor chairs that would work just fine as temporary seat cushions (the outdoor seat cushions weren’t the right shape for my slipcovers). With only one of the original cushions remaining in good condition and the rest being comprised of bed pillows and outdoor cushions, and a less than perfectly fitting IKEA slipcover, this isn’t exactly a classy upscale sofa. But then again, we aren’t classy upscale people so I guess it suits us just fine :). Besides, the gray is kind of a nice cozy change for fall. 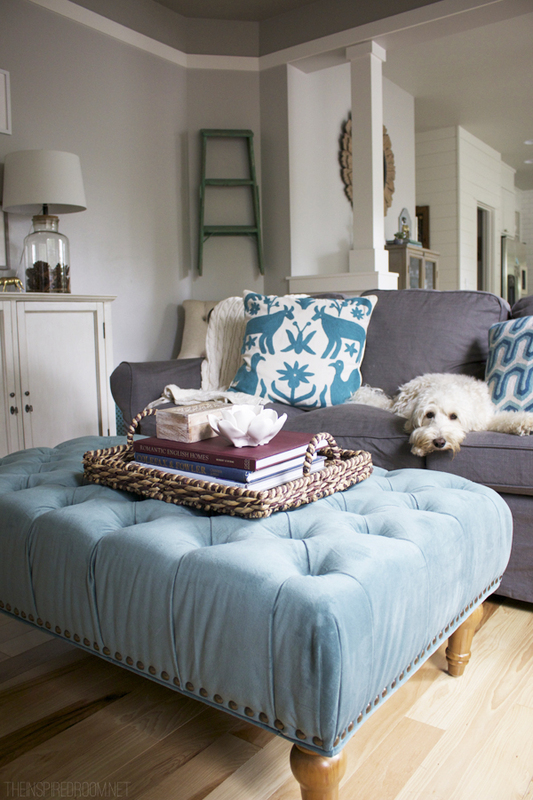 I was happy to have a functioning sofa for my friends to sit on for a baby shower I hosted this week and I’m thrilled to have something to curl up on until the new sofa arrives! :). And Jack & Lily are happy to have their sofa back, too (that’s not exactly good news, though, hahah). Cozy imperfections, that’s what I’m talking about. Let the fall coziness continue. Amen? PS. 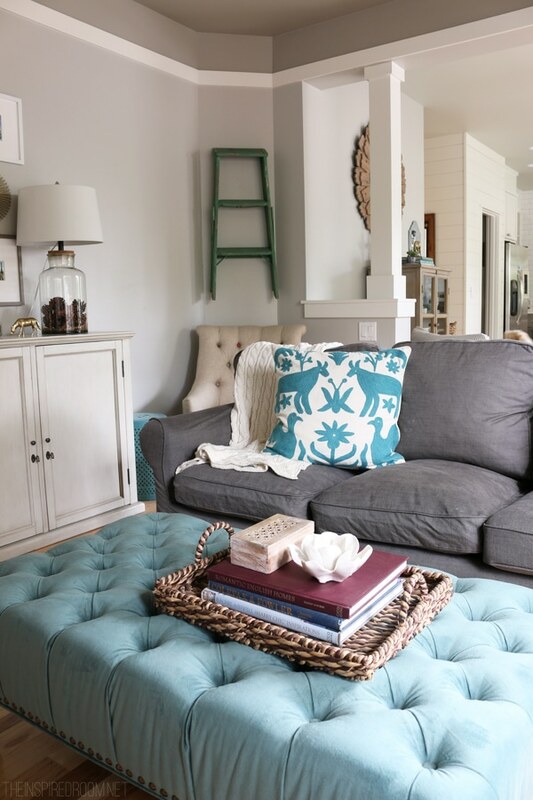 For those who have asked, here’s a link to my tufted ottoman! I recently subscribed to your blog and I look forward to seeing your designs and suggestions whenever you post something new. 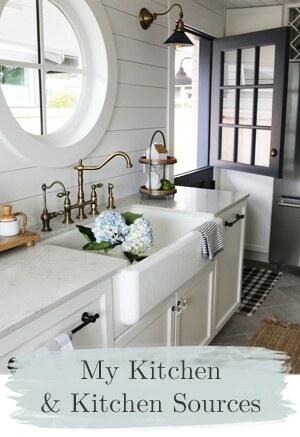 I love the colors you have used in this room and would love to know what color paint you have used on the walls. It is the exact shade I have been looking for! Have a great day! Great COZY interim solution! Could I ask the source of the mirror over the fireplace? I think I saw something similar at Joss & Main. thanks!! I’m glad to hear I’m not the only one who does crazy things like that just to make things work. I like the addition of the gray to your family room. Makes it look very…..cozy! 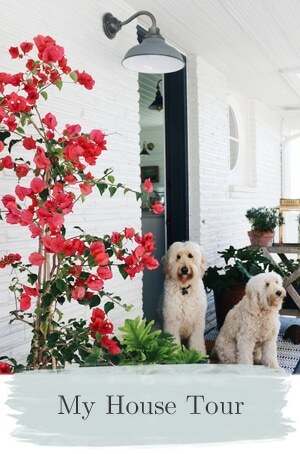 I adore your cozy space… everything about it is so inviting and happy… and I could look at Jack and Lily all day… those faces are just the sweetest!!! You had me @ that sweet doggie on the couch! Oh, + the green step stool, hanging on the wall, was awesome, too! Melissa, I would never have guessed from looking at your photos that you had substituted other cushions in your sofa! Yep, sometimes we just need to make something we already own work for a while. That is the reality for me, anyway :). Thanks for being real! The end product looks very cozy, by the way. I love the grey in your room. You can have new cushions cut at a foam rubber outlet. I had new ones cut for my sunroom wicker sofa (rather than the regular too fluffy cushions that came with it). I used what they call upholstery grade foam rubber. Very supportive. Somewhat firm but feels good and keeps it’s shape. 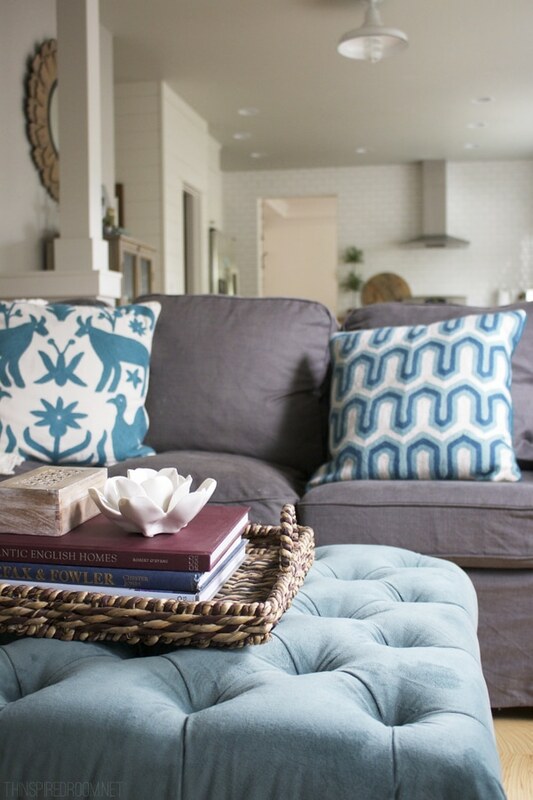 We’ve had those cushions in our sunroom for several years now and they still look great! One of the many reasons I read The Inspired Room–you write honestly about how to make something work with the supplies at hand :). In our entire home, we have 2 things that my husband and I intentionally purchased. The rest has been acquired by inheritance, hand me down, junking, trash picking, etc. I get many compliments about my “style.” And I always tell people–go visit The Inspired Room and learn how to take what you have and make it look like your style. 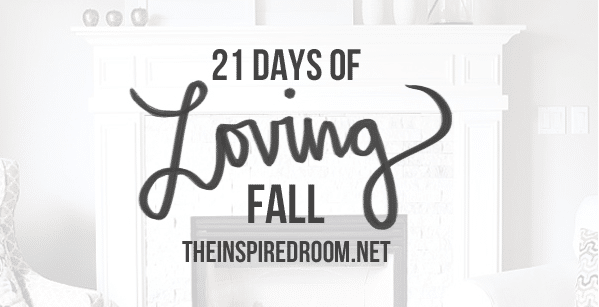 I’ve learned so much about making my home beautiful with the things I have and love from reading your blog :). 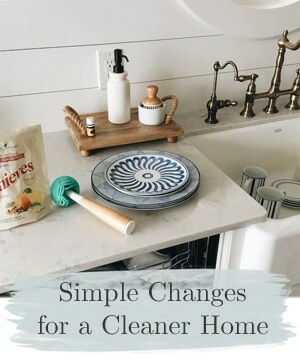 Another great post of making life work in a beautiful way without requiring a big decorating budget. Can’t wait for the book :)! Ditto pretty much every single thing you said Mary! I love the addition of the grey sofa in this room. Grey is so on point for decorating schemes this year and I love how it compliments your color palette including paint, stone and accessories you already have. 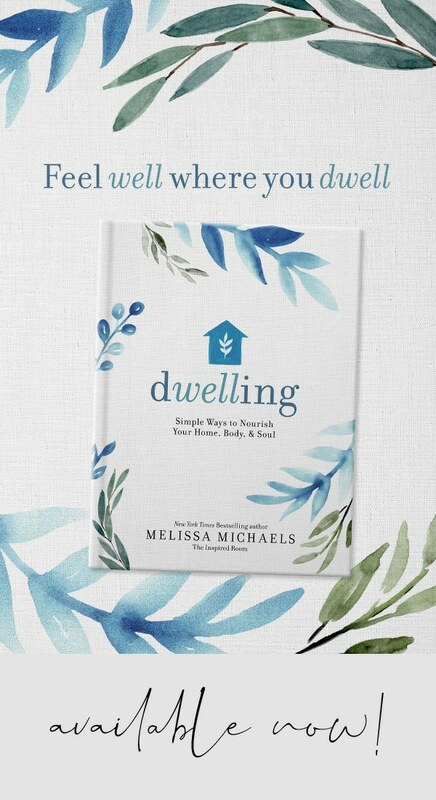 You have taken what you have and incorporated it in your room beautifully. I have followed your blog for a few years and enjoy every post! The couch photographed beautifully. I have Ikea’s Ektorp sofa. It’s 11 years old. I’m going to try your idea of using standard pillows to give them more firmness. I’m also going to pull out the grey cover that I have for it. I always use the white cover as I love a white couch but, our little pug makes it dingy looking in no time after laundering. Will treat myself to a break over the fall season and use the grey one. Not crazy at all, but rather clever! When I moved into my home almost two years ago, I knew I wanted a big comfy reading chair for each of the bedrooms plus the master chair needed to be something I could basically sleep in on the rare occasions when one just can’t recline. I didn’t have any money and wasn’t sure what I wanted anyway so I picked up two taupe resin Adirondack chairs from Home Depot ($18 each) and then picked up some thick outdoor highback cushions to improve the comfort factor. Finally found the perfect chair for my bedroom but still using the Adirondack chair in the guest room because I totally love the print cushion which works perfectly with the color scheme in the room. Not that I’ve just re-homed the queen sleeper sofa in the living room (the one I moved with because “everyone needs a couch” and which was too large, the wrong style and only used intermittently by 3 white cats when it wasn’t holding all my pillows) and am thinking I may not get another couch at all, I’m looking for something cushy and comfy to go with the two fat clubs chairs I already have. Again, I’m not sure what I want and not ready to do it now. SO…the other Adirondack chair comes back from the patio this weekend and with the other highback cushion on it (currently stored in the garage) I’ll have a usable and reasonably attractive placeholder until future decisions later. So we are, none of us, crazy. We are very, very clever. And, even as Barbara say, brilliant! This is why I love to read your blog. Very creative solution. Melissa, the gray sofa looks fine in the space and I totally understand how you feel. I had to go 3 months without a sofa due to the fact that each time they would bring out a sofa, there was some sort of damage on it. Needless to say, the fourth sofa was perfect but I had almost forgotten what it felt like to sit on a sofa….LOL!!! I live the room! Looks great! Where did you get the ottoman? I’ve been looking for one like that. 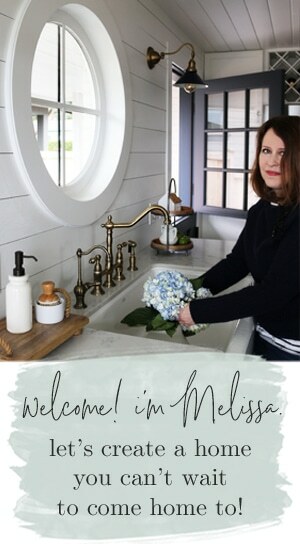 Melissa, I love that you talk about design in and for real life! 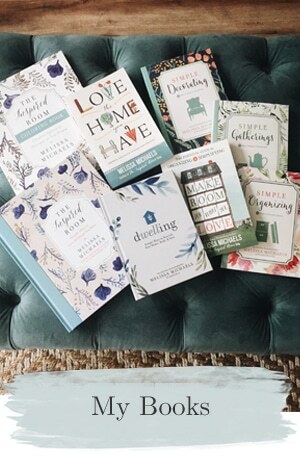 As a designer and pet mom myself, I am always making decorating decisions in my house based on not only what is affordable and beautiful, but also what will realistically hold up well in our home with all of us living comfortably inside its walls! Wonderful attitude, good for you! It’s funny, but it’s the very thing I mentioned in a post I put up just a few minutes ago on my blog… that beauty can exist in spite of imperfections. :-) I’m glad you found a solution. BTW I agree with Shannon – your sweet white pup does look like he is truly sorry! Oh my goodness. 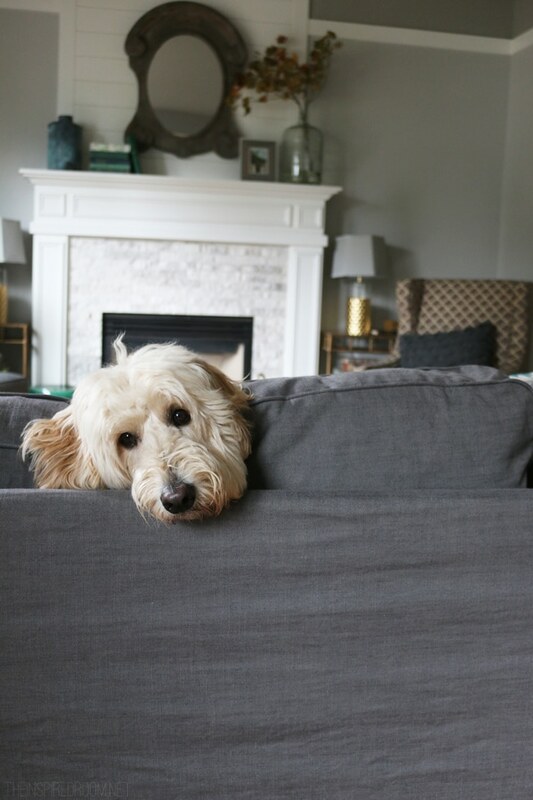 What a sweet face resting on those slipcovered cushions!! Thank you for showing us your imperfections ! I think a person who shares their foibles is much more interesting than someone trying to be perfect. I also have two dogs and can so relate to the less than perfect ways they add to the decor, thanks for letting me know I’m not alone. I think the gray slipcover looks great! In fact I’m thinking about buying the gray cover for my ikea ektorp sofa. I also have white slipcovers that I’m getting tired of washing :) Your home is so pretty. I’m always inspired by you.